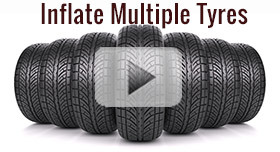 Did you ever want to inflate 8 tyres at once? A product made by Brisbane based RLM Distributing does just that. RLM Distributing specialise in Tyre Accessories and Mining Equipment and Tools. Some of the products like Air Spider that can manage 8 tyres at once which makes sense in the scale of a mine site where a piece of machinery out of action has a cost. "will balance/self regulate the tyre inflation pressure to a preset level on up to 8 tyres simultaneously." However you may want to check the pressure in your spare tyre before you go away - a product that allows you to check your tyre pressure without having to get the tyre out makes sense when it may save your life in an extreme camping emergency.